"My Cactus Heart" just feels fresh and new overall - quite a feat considering its the only genre our local mainstream film industry knows to make 90% of the time. It's not only that the pairing of Matteo Guidicelli and Maja Salvador actually works (a true blue couple in real-life) but it also brings in a narrative style unique in its own way. While at times the movie lacks polish and consistency to be considered an instant classic, the narrative style and the lead actors carry "My Cactus Heart" into something worth a look. 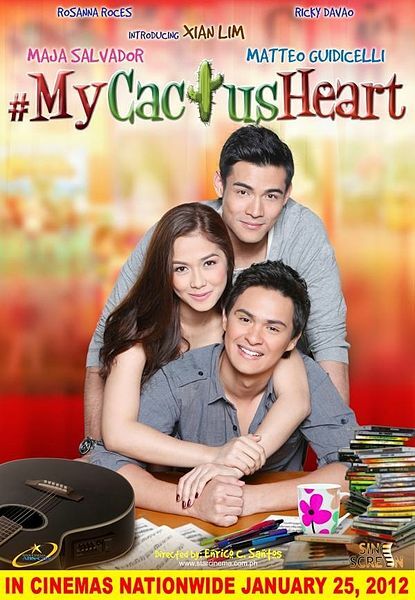 Read on for our full written analysis of "My Cactus Heart". Sandy (Maja Salvador) while at work narrates to her co-worker how she met her soul mate. The story starts when she was still in high school. She and her best friend decide to play a game. Each one of them will draw an illustration for their "soul mates". They will leave the illustrations randomly - knowing one day that these will be returned by the man meant for them. Through the years though, Sandy grows hatred towards men and commitments due to her dad leaving their family with another woman. Sandy decides that she does not want to be a fool for love and be single for life like her mom. Every boy who courts her gets busted so much so that people call her a "cactus heart". Not until she meets Carlo (Matteo Guidicelli) that is who is not only her complete opposite when it comes to love but teaches her cactus heart how to love in return. There are two big things that make "My Cactus Heart" better than your average local romcom. First, the narrative style made the movie more interesting than it should be. To be quite honest, the story was predictable but the flashback system was a breath of fresh air (the style is more or less akin to the television show "How I Met Your Mother") as it actually made the characters have depth not usually seen on local romcoms. This was so effective that the characters' back stories define how the lead characters react to the world around them. For example, you do not only understand why Maja's character hates commitments or why Matteo's character is a hopeless romantic but you actually feel their emotions and what they are going through. Second, the pairing of Matteo and Maja just simply works flawlessly. They make a beautiful pair on-screen and everything feels natural. On the acting department, the biggest surprise was Matteo. He just showed versatility that we didn't expect from him (not even accounting for how he has improved his Tagalog greatly). Where the film fails to make an impact is in its polish and consistency (actually a common problem on local films). The first half in particular has a lot of confusing moments especially when it came to how the timeline was presented. The film also had several scenes being cut abruptly or having video quality dip significantly even on the same scenes. The cheesy lines and jokes were just average too. At times it will make you smile even laugh but on other times the lines just feel stale. We won't lie, "My Cactus Heart" wasn't on our anticipated list but after seeing it, we have to admit that our assumptions were completely wrong.